Shamil Basayev, who has died at the age of 41, was wanted by Russian authorities in connection with bloody attacks in Russia. These include the Beslan school hostage siege in 2004 that left at least 331 people dead and the siege at a Moscow theatre in 2002 that left 129 dead. The fearsome Chechen rebel leader was also placed on the UN Security Council's official terrorist list in 2003 after Washington classified him as a threat to the US. Shamil Basayev had long threatened a series of "kamikaze" attacks inside Russia, arguing that Russian civilians were legitimate targets. He led the first Chechen mass hostage-taking in the southern Russian town of Budyonnovsk in the summer of 1995, when a hospital and more than 1,000 patients were captured. The rebel leader also claimed to have organised the seizing of Moscow's Dubrovka theatre in September 2002. He is believed to have been behind a stadium bomb attack in Chechnya's capital, Grozny, in May 2004, that killed Moscow-backed President Akhmad Kadyrov. Basayev is said to have organised a series of attacks on government buildings and police stations in neighbouring Ingushetia in June 2004, which left almost 100 people dead. And in October 2005, he claimed a major attack on Nalchik, in southern Russia, in which dozens of rebels and members of the security forces died. He also boasted that he had trained Chechen female suicide bombers - the infamous "Black Widows" brigade. The fugitive warlord vowed to fight the Russians at every opportunity and whatever the cost. "The Chechen nation is involved in the national liberation struggle for its freedom and independence and for its preservation," he said in a statement in September 2004. He was suspected of having links with al-Qaeda operatives, although he denied ever having met Osama bin Laden. "I have not met Bin Laden. I received no money from him, but I would not have declined the offer," he said. He blamed Moscow for the Beslan deaths which he called a "terrible tragedy" and denied killing any children. Shamil Salmanovich Basayev was born on 14 January 1965, in the mountain village of Vedeno in south-eastern Chechnya. He was named after famous mullah and warrior Imam Shamil, who led the mountain tribes' resistance to Tsarist armies in the 19th Century. Basayev's long beard was in keeping with his Islamic faith - and he had a wooden leg as his own was amputated after he stepped on a mine in 2000. According to BBC Russia analyst Steven Eke, the rebel leader combined charisma, and surprising flashes of humour, with utter ruthlessness and an obsession with how history would view him. Basayev's early career revealed romantic and revolutionary ambitions - he says he had a poster of Che Guevara on his wall as a student in Moscow where he briefly studied land management. He later became a computer salesman. He first came to prominence soon after the attempted communist coup d'etat in 1991, when he hijacked a Russian passenger jet and forced it to land in Ankara in Turkey. There, he demanded a press conference to tell the world what was going on in Chechnya. 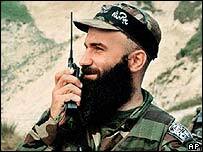 Basayev went on to become one of the leading commanders of the resistance when Russian forces invaded Chechnya at the end of 1994. "Russia is the last empire: it is built on blood," he said in a BBC interview in 1999.